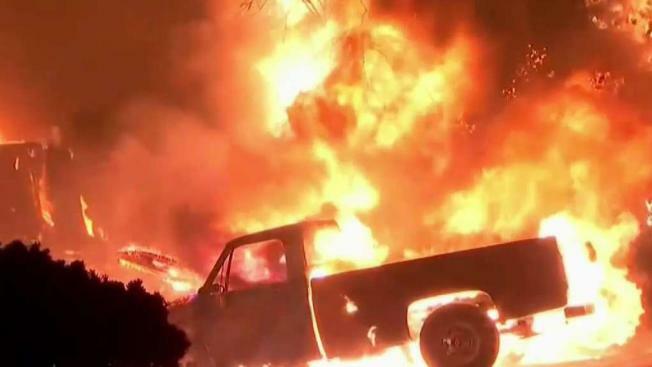 Authorities on Monday reported 13 more fatalities from a blaze in Northern California that destroyed a town, bringing the total death toll so far to 42 and making it the deadliest wildfire in recorded state history. Hundreds of people were unaccounted for by the sheriff’s reckoning, four days after the so-called Camp Fire swept over Paradise, a town of 27,000, with flames so fierce that authorities brought in a mobile DNA lab and forensic anthropologists to help identify the dead. The Camp Fire late Monday had grown to 117,000 acres and is 30 percent contained, Cal Fire officials said. A day before the fire started, PG&E contacted a woman about sparks from its lines on her property in the community of Pulga. On Monday, declared the area surrounding those lines a crime scene.